Public concern over high-profile mistakes in IVF clinics and the concomitant increase in governmental regulation, have given rise to widespread recognition of the need for accreditation of IVF clinics. Modern accreditation schemes are largely based on the principles of ISO 9001 and related standards, at the heart of which lies the expectation of a formal quality management system. Risk analysis and risk minimization are also being demanded of IVF clinics, but many only have limited understanding of how to approach these essential management tasks. This book brings together the basics of quality management and risk management, focussing on 'prophylactic management' - prevention rather than cure. Each chapter in this new edition is fully updated and extended to include new material such as, quality and risk management in the ART clinic, and an illustrative example of a 'well-run' clinic. 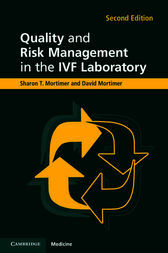 This is the essential guide for clinicians and IVF laboratory staff.